Mr./Ms. Senior Executive: Your company has established a requirement to add to your key management ranks and a decision has been made to engage an outside recruiting source. There are a variety of attitudes which exist about recruiters and several ways an organization approaches the idea of using their services. Corporate officials have asked on various occasions about how to work best with a search firm. 1) First and foremost, perform an analysis of where you stand currently. Has the position been open for a while or is it relatively new? Are there candidates (external and/or internal) being considered? If so, is it your plan to see “who else may be out there”? What is your attitude toward a proposed outside firm? Do you view them as a trusted advisor or just another source? (or one of many?) An assessment of the search status and attitudes will lay the groundwork relative to how, or if the recruiter should approach your assignment. 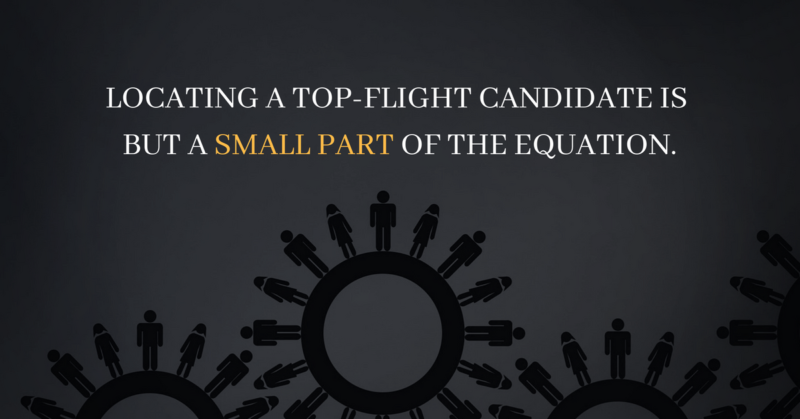 2) Locating a top-flight candidate is but a small part of the equation. With today’s technology, discovering “who” is far easier than the days of corporate directories and Rolodex files. Reaching out to a successful recruit, effectively presenting an opportunity, and moving the person from passive candidate to interested contender… through the various steps of an interview process to final offer, acceptance (while side-stepping the pitfalls of other suitors and counter-offers) and ultimately starting employment with your firm is both science and art. 3) Allow the recruiter to perform his/her job. If you hire a lawyer, visit your dentist or call a plumber to install a faucet…chances are, you tend to leave it to the professionals. Quite often, this isn’t the case when engaging a recruiter. If right from the get-go, you’re placing one, two, or more staff members between the hiring manager and the recruiter, you may already be placing your company in a position to complicate the process. Ensuring that it will extend the time of completion considerably and risk losing and/or alienating the very top performer you’re attempting to attract. 4) Don’t step all over yourself. In our era of specialization and business “sophistication”, too many companies make the job of hiring a new employee much harder than necessary. Beginning with failing to allocate time for the hiring manager to provide a realistic, workable job description…not a “boiler plate” corporate version. This means providing specific job requirements and objectives coupled with a realistic list of qualifications. Hiring the “best athlete” should be the priority. There can often be a tendency to hire a resume…i.e. the person who “checks the boxes”. These types of hires tend to insulate (the ultimate in committee hiring) staff members from responsibility. The staff survives – but the hiring manager and company lose. Repeated enough times, nobody survives. 5) It is important to establish time-lines and insist on clear, ongoing dialogue and follow-up. (It seems as though every known communication device has replaced a live conversation.) The very important mission of recruiting the best people for your company is not an exact science. The hiring of effective people takes some work, and may at times, result in a variety of missteps…failure to land a good candidate, a counter-offer or unforeseen changes in the marketplace, to name a few. These are why it’s important for the recruiter and key corporate officials to work together toward a mutual goal. To the Hiring Manager: The new employee will be your responsibility. We recommend that you become involved early… remain engaged – and ensure the hiring process continues forward. Generally, the hiring manager has the most experience, understanding and instinct regarding a candidate’s potential for success. He / she is in the best position to express passion and enthusiasm, while evaluating a candidate’s level of interest and determining next steps — or possibly…”no” steps. WHY would a company precede an initial meeting between a candidate and the hiring manager with “flavor of the day” testing and a battery of screening steps? It’s not time or cost effective and most successful people are just not into it. With available technologies, the hiring manager can track interview progress 24/7 and coordinate involvement (if/as required) of various team members who may be called upon to participate (HR functions, secondary interviews, testing, etc.) in various stages of the process. The key is early and continued involvement. There is a top performer ready contribute…and with timing and sound execution they will land at their company of choice. Maybe yours?